Home /Can Web Apps be an Alternate Option to Native Apps? Whether you want to enhance the productivity and speed of your business internal operations or give your customers a memorable experience of your brand/product/service, you will need an application to do any of that. The world belongs to mobile users and it is impractical to leave them out of your marketing plans. You have multiple ways to access them e.g. web, native and hybrid applications. Each app type has its pros and cons but native apps get a lot of limelight because of how robust, fast and smooth they are. Such popularity of native applications can often be confusing for business owners as they cannot convince themselves to get a web app even if they want to. If you are on the fence of which type of app to get for your business, here is some information about web apps or native apps to help you reach a decision. The first thing you should know is how a web app differs from a native application. Web application is developed for browsers and not particularly a mobile device or a specific OS platform. On the other hand, developers have a platform in mind right from the start when they are creating a native application. Since the development of a web app is somewhat free of device and platform related restrictions, it can run on either of them without any issues. Users of the app do not have to install any applications on their devices—they work on a web-based interface. What Makes Web Apps a Viable Option? Let’s take a look at some of these major benefits of web applications to understand why they can be a good alternative to native applications. A web app is not installed on the user’s device. Instead, it resides on your server wherein the user uses a browser to access it. If you need to make any updates to the application, you do that at your end and that’s about it. Your app users do not have to download the updates and execute them manually. It won’t be wrong to say that web apps are more accessible than native applications. Native applications use a lot of resources on the device of the user to run whereas web applications do not require that many resources. A user with an old device with low specifications can access your web app in the same way as a user with the latest device does. On the other hand, that’s not possible with native applications. Affordable web app development is one of the biggest attractions for business owners. The development of a web app is usually much more affordable than that of native applications. Moreover, if you are a perfectionist and you want your native application optimized for all the mobile operating systems out there, your development budget will bloat. When you have thousands and millions of people using your application, you will face a lot of difficulty in making them all update your app. Updates and patches are often for the purpose of fixing any security holes in applications. When people do not update their applications, they risk the security of their systems and information. Such lack of knowledge about updates can be even more disastrous if it is a business’ internal application. With a web application, you are the one in charge of updating the app and fixing any security issues. You can add the application on a mobile device’s screen just like you add a native app. Progressive web apps can work offline as well. Some of the functionality can become limited in the offline mode but you can decide the crucial functions of your app at the time of development and enable them in the offline mode. Your progressive web app can even allow you to send push notifications now—just like native apps do. One of the main advantages of progressive apps is that their interface is just like their native counterparts. Even the gestures that users have to perform are quite like gestures on native apps. 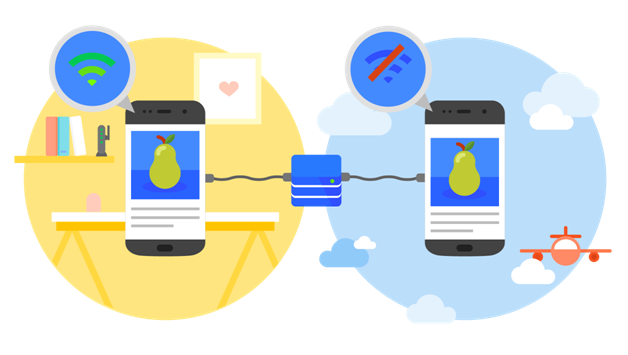 Progressive web apps now use cache to their advantage to improve performance. You don’t have to submit your PWA to Google Play Store or Apple App Store—you play by your rules. You might be wondering why you have to be the first to experiment with a (progressive) web app. You will be surprised to know that some of the largest companies of the world have already used progressive web app and benefitted from them. 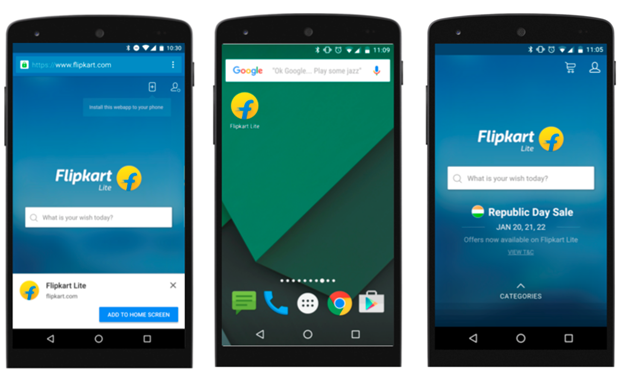 Here are some companies that benefitted from progressive web apps. The type of application you pick for your business depends on many other factors. If business A benefits from a native app it does not mean that a business B will benefit from it too. You can safely say that the gap between native and web apps is closing in fast. There is no doubt that a properly developed and thought-out web app can be a good alternative to a native application today and the future will favor web apps even more.